Long noncoding RNAs mean more than HOTAIR. Over the past 10 years, scientists say new methods, including deep sequencing and DNA tiling arrays, have enabled the identification and characterization of the human transcriptome. These techniques completely changed our understanding of genome organization and content and revealed that a much larger part of the human genome is transcribed into RNA than was previously assumed—about 70%. These scientists used these techniques to identify and characterize unannotated transcripts whose rare or transient expression is below the detection limits of conventional sequencing approaches. The data also show that intermittent sequenced reads observed in conventional RNA sequencing datasets, previously dismissed as noise, are indicative of unassembled rare transcripts. Collectively, they say these results reveal the range, depth, and complexity of a human transcriptome that is far from fully characterized. 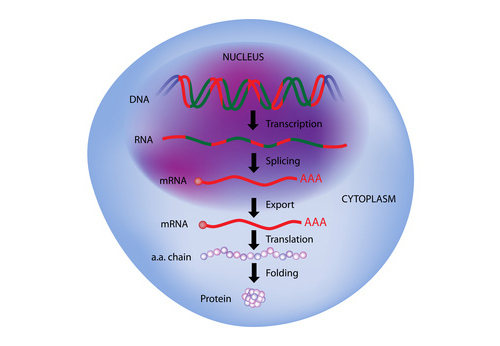 Noncoding transcripts are RNA molecules that include classical “housekeeping” RNAs such as transfer RNAs (tRNAs), ribosomal RNAs (rRNAs), small nuclear RNAs (snRNAs), and small nucleolar RNAs (snoRNAs), which are constitutively expressed and play critical roles in protein biosynthesis. Among these noncoding RNAs are numerous long noncoding RNAs (lncRNAs), which are defined as endogenous cellular RNAs of more than 200 nucleotides in length that lack an open reading frame of significant length (less than 100 amino acids). The RNA molecules constitute a heterogeneous group, allowing them, scientists point out, to cover a broad spectrum of molecular and cellular functions by implementing different modes of action. lncRNAs are roughly classified based on their position relative to protein-coding genes as intergenic (between genes), intragenic/intronic (within genes), and antisense. Initial efforts to characterize these molecules demonstrated that they function in cis, regulating their immediate genomic neighbors. lncRNAs can regulate gene expression at epigenetic, transcriptional, and post-transcriptional levels and take part in various physiological and pathological processes, such as cell development, immunity, oncogenesis, clinical disease processes, and more. A classic lncRNA, HOTAIR, was originally identified through work done by Howard Chang, M.D., Ph.D., at Stanford, and Dr. Rinn. Their research eventually led to the discovery of this 2.2 kilobase spliced RNA transcript that interacts with Polycomb group proteins to modify chromatin and repress transcription of the human HOX genes, which regulate development. It remains unclear as to exactly this is accomplished. HOTAIR, it was found, originates from the HOXC locus and represses transcription across 40 kb of that locus by altering the chromatin trimethylation state. Hox genes, a highly conserved subgroup of the homeobox superfamily, regulate numerous processes including apoptosis, receptor signaling, differentiation, motility, and angiogenesis. Aberrations in Hox gene expression have been reported in abnormal development and malignancy. HOTAIR works to repress Hox gene expression by directing the action of Polycomb chromatin remodeling complexes in trans to govern the cells’ epigenetic state and subsequent gene expression. HOTAIR expression is increased in primary breast tumors and metastases and its expression level in primary tumors can predict eventual metastasis and death. The recent discovery that lncRNA HOTAIR can link chromatin changes to cancer metastasis furthers the relevance of lncRNAs to human disease. Dr. Chang and his colleagues say that the finding that several lncRNAs can control transcriptional alteration implies that the difference in lncRNA profiling between normal and cancer cells is not merely the secondary effect of cancer transformation, and that lncRNAs are strongly associated with cancer progression. The researchers showed that lncRNAs in the HOX loci become systematically dysregulated during breast cancer progression. They further demonstrated that enforced expression of HOTAIR in epithelial cancer cells induced genome-wide retargeting of polycomb repressive complex 2 (PRC2) to an occupancy pattern more resembling embryonic fibroblasts, leading to altered histone H3 lysine 27 methylation, gene expression, and increased cancer invasiveness and metastasis in a manner dependent on PRC2. On the other hand they noted loss of HOTAIR can inhibit cancer invasiveness, particularly in cells that possess excessive PRC2 activity. These findings indicate that lncRNAs have active roles in modulating the cancer epigenome and may be important targets for cancer diagnosis and therapy. Thus, the investigators say, differential expression of lncRNAs may be profiled to aid in cancer diagnosis and prognosis and in the selection of potential therapeutics. Two years ago the GENCODE consortium, within the framework of the ENCODE project, presented, and analyzed the most complete human lncRNA annotation to date. The data comprise 9,277 manually annotated genes producing 14,880 transcripts. The identification and annotation of this wealth of lncRNAs leaves scientists with a lot of research to do to fully characterize the varied functions of these unusual RNAs. Their identification also challenges technology developers to produce the tools to necessary for these analyses.